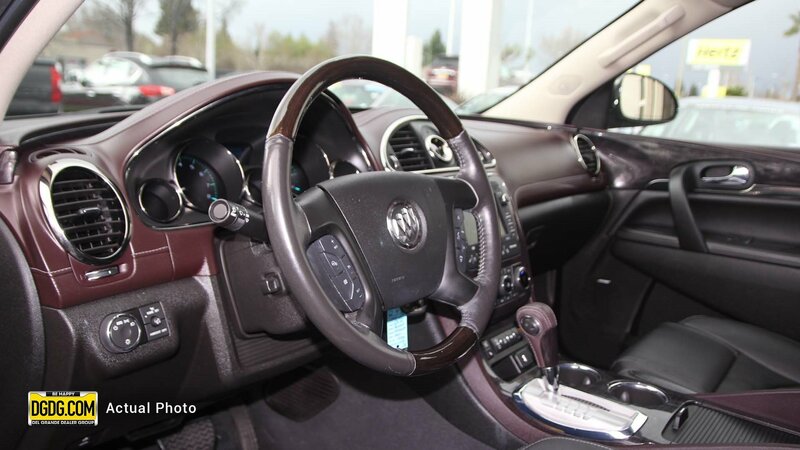 DGDG Certified Used 2015 Buick Enclave Premium Group (AWD, 6-Speed Automatic Electronic with Overdrive, 3.6L V6 SIDI VVT). Oil and filter changed. Premium Package, Navigation System, Perforated Leather-Appointed Seat Trim, Power Tilt-Sliding Moonroof, Power Liftgate, Exterior Parking Camera Rear, Blind spot sensor: warning, Bose Performance-Enhanced 10-Speaker System, 4500lbs Trailering Package, ABS brakes, Articulating Headlights, Automatic temperature control, Electronic Stability Control, Front dual zone A/C, Heated & Cooled Driver & Front Passenger Seats, Heavy-Duty Cooling System, Memory seat, Power driver seat, Power passenger seat, Power Tilt & Telescopic Steering Column, Power-Folding Heated Body-Color Outside Mirrors, Rear air conditioning, Rear Parking Sensors, Traction control, Trailer Hitch, Ventilated front seats, Wheels: 20 Ultra Bright Blade Silver Aluminum. DGDG Certified Used Cars offer a 12-Month/12,000-Mile Limited Powertrain Warranty, a 3-Day/250-Mile Money-Back Guarantee, an Exclusive 160-Point Vehicle Inspection, Premium Tire and Brake Reconditioning Standards, Third-Party Price Validation, and a Vehicle History Report. Prices do not include government fees and taxes, any finance charges, any dealer document processing charge, any electronic filing charge, and any emission testing charge.